You know when you get to the beach early, and you have the place all to yourself, and you pick a nice spot to set up camp for the day, then someone else comes along and sets up right next to you… so close you can smell their Doritos (TM) and excessively sunscreened children… even though there is a whole, empty beach for them to choose a spot from? Yeah, well, this piece is kind of like that. Only probably more violent. And more blue. 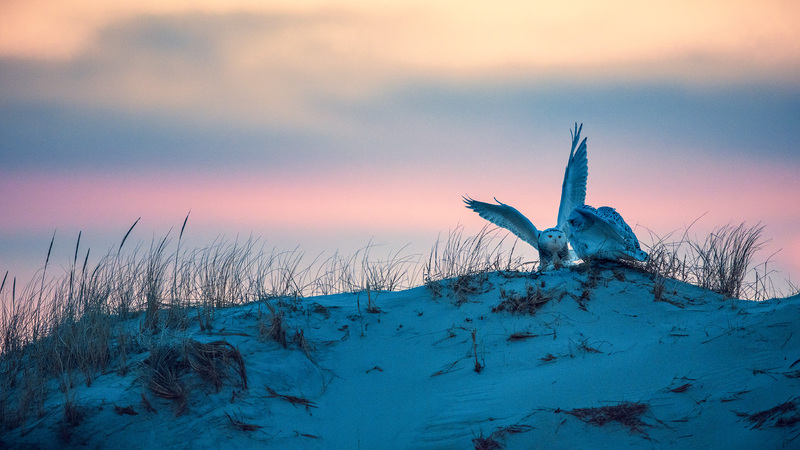 Posted in Wildlife and tagged LBI, lbi snowy owl, Long Beach Island, snow owl. Bookmark the permalink. A rare two snowy moment! I love it when they are together, even if they are fighting. I skipped the fight sequence as it is quite violent. 🙂 You know that one? THERE IS A WHOLE EMPTY BEACH!!! WHAT ARE YOU THINKING SITTING RIGHT ON TOP OF ME??? ?